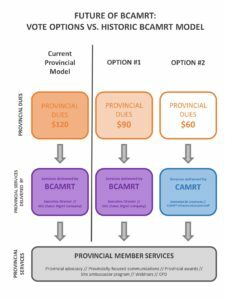 As you know from communications throughout 2017, the June vote of BCAMRT members resulted in the adoption of a new association model for the province. In the new model, provincial services you are accustomed to receiving from BCAMRT, such as provincial advocacy, provincial updates and networking, local events, and more will be delivered by a new unit of the CAMRT dedicated to BC: CAMRT-BC. New levels of dues are instituted for 2018. As reflected in the voting question, CAMRT-BC is delivering provincial association services at a substantial savings to MRTs in BC. The new provincial dues of $60 reflect a 50% ($60) reduction over 2017 levels. The dues collection process for 2018 is being run by CAMRT directly. 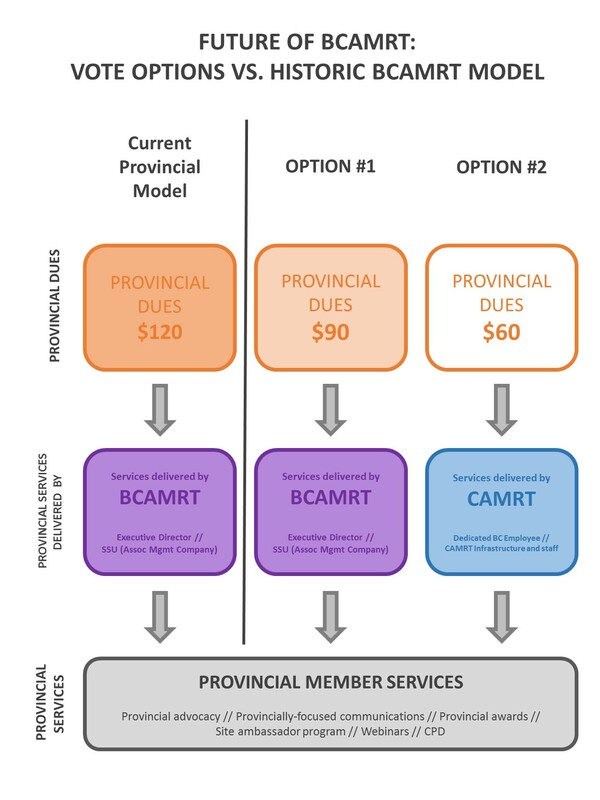 Members will pay both the $60 CAMRT-BC dues for provincial services, and the $220 CAMRT dues for national services at the same time. (NOTE: These rates reflect full practice membership dues. Please see www.camrt.ca/bc for more details about dues). A Provincial Manager for BC has been hired to guide the delivery of provincial services at CAMRT-BC. CAMRT and BCAMRT continue to work together closely to transfer all institutional records and know-how. CAMRT and BCAMRT have also been working together closely to make sure that advocacy projects carried out by BCAMRT are passed on to CAMRT-BC. In particular, the transfer the ongoing advocacy work surrounding the regulatory college for BC MRTs. An online vote of BCAMRT members was held between May 31 and June 18 to determine the future of the BCAMRT. The vote resulted in the adoption of a new association model where the provincial services you are accustomed to receiving from BCAMRT, such as provincial advocacy, provincial updates and networking, local events, and more) will be delivered by a new unit of the CAMRT, dedicated to BC, called CAMRT-BC. Just under 40% of the BCAMRT membership cast their votes in this referendum, and 56.4% of these ballots were cast in favour of the CAMRT-BC option. This result gives BCAMRT and CAMRT the mandate to work together to implement the transition to the CAMRT provincial service delivery model in BC by December 31, 2017. Members voted on two possible options for the future of the BCAMRT (please see here for a table outlining the two options and the differences between them). Prior to the vote, we prepared answers to a range of questions from BC members. Please see here for answers to all the questions you may have about this crucial period for the BCAMRT. The BCAMRT and CAMRT also collaborated to deliver a number of presentations on the future of association services in BC. All were recorded for your viewing and consideration. This presentation is from the 2017 Annual General Conference. This webinar was presented on March 20, 2017 by BCAMRT President Jackie Wallace, BCAMRT Executive Director Darlene Hyde, and CAMRT Representative Christopher Topham. The presentation explores options for the BCAMRT going forward, with regards to improving efficiencies and a discussion of potential dissolution of the BC chapter and incorporation into the CAMRT.